"In these images you can see the before and after of our visit, you can see a small modification. Similarly other modifications were made to the website which, though not visible on the main page, surely will take them a few hours to return to how they had it, if they can. 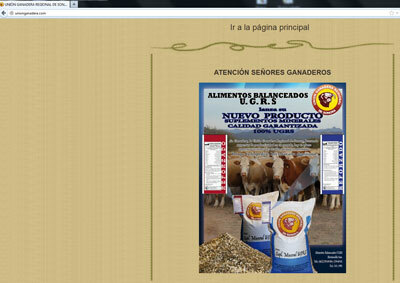 On the page, all references to the sale of cattle were removed. All the orders, auctions, types of animals auctioned and some news. 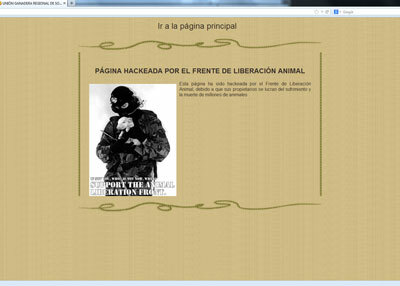 The hacked website is www.unionganadera.com and although our way to enter it was with tools to get user names and passwords, the lack of security on the page was surprising. The user name was 'Admin' (without quotes) and the password was '123456' (again without quotes). While there are those who benefit from suffering, we'll be there. "En las imágenes que se pueden ver del antes y el después de nuestro paso por ella, vemos una pequeña modificación. Del mismo modo se hicieron algunas modificaciones en la página, que aunque no sean tan visibles como la página principal de la web, seguro les llevará unas cuantas horas volver a dejarlo cómo lo tenían, si es que pueden. Dentro de la página se eliminaron todas las referencias que había sobre la venta de ganado. Se eliminaron todos los pedidos, las subastas, los tipos de animales subastados y algunas noticias.